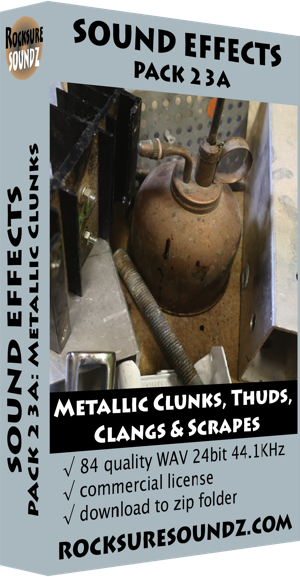 Sound Effect, Pack 23A Metallic Clunks, Thuds, Clangs and Scrapes. This pack contains a wide variety of different metallic sounds ranging from small pin clangs, and medium sized clunks, right through to large deep scraping sounds. All sfx were recorded with high quality microphones and analog recording equipment, and are presented here as a zip of 24 bit/44.1kHz wav files.